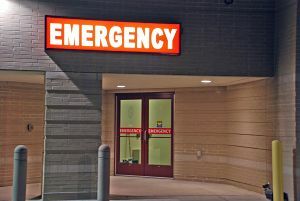 The Emergency Department at Montgomery County Memorial Hospital is ready when emergencies arise. Our Emergency Team of doctors, physicians assistants, nurse practitioners, and nurses are specially trained in the emergency care of children, heart conditions, and other emergency situations. Our Emergency Services uses the most modern technology in acute cardiac care, acute stroke care, and tele-health communication over distance with psychiatric specialists for crisis intervention. We work closely with local emergency responders. Should you have a medical emergency, dial 911. Patients who come to Montgomery County Memorial Hospital with stroke symptoms now have the advantage of a timely neurology consultation from Nebraska Medicine without leaving Red Oak. This new partnership allows emergency medicine physicians to quickly consult with Nebraska Medicine Telestroke neurologists to offer MCMH patients the best stroke care possible. 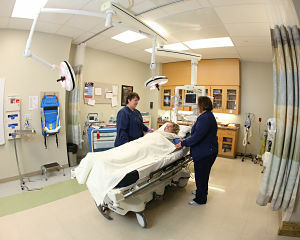 The Telestroke program allows MCMH staff to connect with Nebraska Medicine stroke experts through advanced videoconferencing technology, which could have a significant impact on minimizing long-term brain damage from stroke. 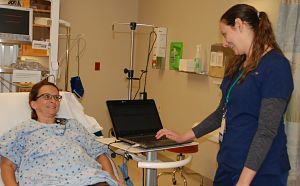 A telemedicine system with a monitor and remote-controlled camera provides two-way video and audio communication between the Nebraska Medicine neurologist, patient and the MCMH provider. It also allows the neurologist to view CT images to best assess the patient's condition in real time and help determine if a patient is a candidate for specialized stroke therapy. With a stroke, every minute counts. A clot-busting medicine can be lifesaving, and is most effective when given within three hours of the onset of a stroke, so the fast response of Telestroke intervention will undoubtedly improve stroke care. The sooner a stroke is treated, the less brain damage a patient sustains. With Telestroke, patients "see" a neurologist within minutes of arriving in emergency, regardless of the distance between them. "A stroke can be one of the most personally devastating events someone can experience. I am so proud of our MCMH stroke team. I have never before worked with any group of people so committed to fighting for their patients' quality of life," said David Abercrombie, CEO at MCMH. If you witness someone with the following symptoms, call 911 or transport him or her directly to the nearest emergency department. 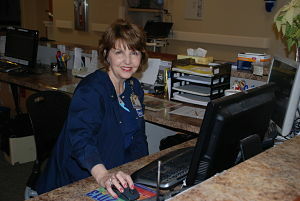 For more information about MCMH's new Telestroke program, visit mcmh.org or call 712-623-7000.